Portable toolboxes are handy mobile work stations for home-repair DIY hobbyists or professional service technicians (Source). Some of the portable toolboxes come with wheels designed to be hauled about the worksite like the Bostitch rolling toolbox, the Keter Masterloader, and the Stanley FatMax. Others, like the Excel Portable steel toolbox don't have wheels but are intended to be lugged about wherever you need quick access to your tools. These portable tool chests typically feature compartmentalized bins and cleverly organized interiors to accommodate your needs whether you are a plumber, an electrician or just a home-repair aficionado that needs sturdy and remote access to their tool chest (Source). The 15 lb., Keter is our top pick- it measures 24.2" x 14.9" x 16.3". This particular rolling toolbox unfolds from the center console revealing a compartmentalized interior. It is one of the more inexpensive options, but it has many satisfied fans across the Internet who attest to its design and construction quality. One construction worker describes treating it rather roughly on job sites, saying that it's held up well overall. He stores a variety of different tools including his hand drills, sawzall, impact drivers, a large toolbelt and a variety of different AC adapter chargers inside, as well as many different bolts and nuts inside of the small plastic compartment areas. He also says that the handle is designed well- it slides out and then catches so that you can push and pull this portable toolbox in different directions. One piece of advice he had for new buyers is that they should ensure that the center console lock is latched before you begin rolling it around because if you decide to pick it up by the handle, the latch will open and all the tools will fall out. A recreational camper says that it is a great chuck box- saying that the top area's ideal for smaller objects like first aid kits, batteries, knives, and he is able to store a nesting cook set inside for his camping purposes. One other reviewer comments that he's able to store over 75 pounds of tools inside of it, dragging it up steep steps, and generally subjecting it to a great deal of rugged work environment abuse without experiencing any breaks. In all, this is a well-thought out portable rolling toolbox that is fairly inexpensive if you're looking for an easy way to organize and access your tools while on job sites. Let's take a look at five of the best-selling portable toolbox organizers on the market today and see how they compare. The 15 lb, 24.2” x 14.9” x 16.3” Keter New Masterloader Portable Rolling Tool Box is a very good option that has 2 removable bins on top with ball bearing slides that allow full spread accessibility. Its users love its excellent quality and design, but also note that the central auto-locking mechanism on top may break easily. Its bins are compartmentalized and it has tool dividers inside for better organization. The large bottom compartment can be used for larger or rarely used items. It is made of sturdy plastic and has sturdy rubber tires and an extendable handle that allows for easy transport. 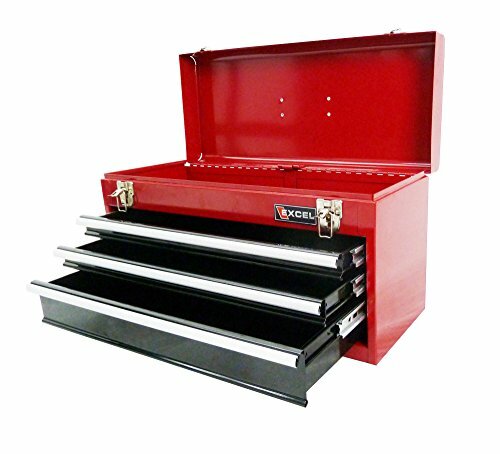 This portable tool box is a solid option if you are looking for a compact and affordable tool storage solution. Users of this rolling tool box are quite satisfied with its good construction, ample storage, and how easy it is to roll around. They like that the top compartments have enough space for small tools and objects, and the main bottom bin can hold a lot of the larger tools. Users also think that the pullout handle is sturdy and slides out really easily and seems rugged enough to last. The main complaint regarding this product is the locking mechanism that some users say broke easily. The 19 lb, 24” x 14” x 11” Excel TB133A Portable Tool Box is a nice-looking option that is made from cold rolled steel. Its users say that it is decent enough for the price, but also note that it may not carry tools that are too heavy due to the poorly attached handle on top. It has a top tray and underneath there are three drawers with full-length aluminum pulls. It has a comfort grip handle, two latches, and an industrial powder coat paint finish. This handy tool box is a reasonable option if you are looking for a portable tool chest that is made of steel and if you don’t need one that has wheels. This product has received mixed reviews from users, with some liking its attractive design that holds lots of tools for its size, while others being disappointed with its quality. Some users say that it is built well, but a number of others think that the metal used for construction is very thin, and the drawers are mediocre and often don’t push or pull smoothly. Despite some issues, many users still consider it a decent enough purchase due to its very low price point. The 18.9 lb, 13.6” x 30.6” x 19.2” Bostitch BTST19802 Rolling Tool Box is a well-designed option that has a removable tool box that attaches on top. Its users love its quality which is very good for the price, but also note that its plastic may be a bit flimsy in spots. The bottom bin has two drawers, and a large lowermost compartment that swings out on a swivel. It has 7” full rubber wheels, a load capacity of 70 lbs, and a useful volume of 10 gallons. The back of the toolbox has two spots with bungee for levels, stock, etc. The extendable roller handle is built into the lower section. 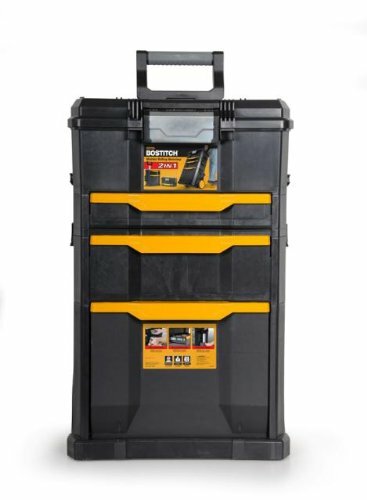 This rolling tool box is a very good option if you are looking for a portable and effective storage chest for your tools. People who bought this product agree that it is made of decent enough quality for its price point. They like that it allows you to get to your tools with minimum fuss, with the drawers gliding quite smoothly. One user particularly liked that the box is tall enough for the top surface to double as a temporary work area. Since the box is made of lightweight plastic, some users recommend careful handling, which means that users who require heavy duty containers will not find this the best option. The 57.5 lb, 23.5” x 13” x 42.5” Best Choice Products Portable Rolling Tool Storage Box is a good option that is made of solid steel. Its users like that it has a number of nice and spacious drawers, but also note that some of them sometimes get stuck. The product comes in two pieces — a tool chest on top, and a cabinet below. The top chest has 3 small drawers, 2 trays, and a large drawer. The bottom part has 2 large drawers and 1 big cabinet with a single door. Top tool chest unit comes with a lock and keys for security. Drawers and trays include a foam material mat that can absorb oil and help keep your tools in place. Side handle and 4 omni-directional wheels make this unit easy to move around. This rolling cabinet is a practical option if you are looking for a relatively large yet mobile storage unit. The general user consensus on this item is that it is not the most durable toolbox of all time but it gets the job done. They like that its drawers, trays and cabinet are quite spacious and fit everything that most users need for mobility. Many also say that it is quite sturdy for something that is very competitively priced. A number of users, however, complain that the steel gets dented quite easily, but one user said that it is not something that discounts its usability anyway. Another problem that some users encountered is the stiffness of the drawers when being pulled. In addition, the bottom cabinet door may also get stuck when pushed too far back. The 23.1 lb 21.6” x 16.2” x 24.8” Stanley 020800R FatMax 4-in-1 Mobile Work Station is a well-designed option that has a patented tiered cantilever multi-level rolling system allows easy access to all 4 storage areas at the same time. Its users love that its design allows effortless access to all your tools, but also wish that the material used was more durable. It comes equipped with a tool box, tray, organizer, and large bottom bin. The top of the lid features a V-groove track that can help secure lumber, pipe, and other materials for easy sawing and cutting. It features a telescopic handle and heavy-duty wheels. A simple pull-up motion of the front latch opens the unit and provides easy access to its contents. When the Mobile Work Station is pushed closed, a large front latch locks the unit automatically. This 4-in-1 workstation is an excellent option if you are looking for a well-designed tool storage unit that doubles as a work bench. Most users of this product agree that its opening system for access to all areas at the same time is its best feature. They love that it holds a lot of tools and other items and that it’s a breeze to move it from one place to another. However, some users note that it hogs space when open. Moreover, the handle may be too short for some people. Also, the wheels are not the most durable, and may not be able to handle sliding down the stairs, especially if the box is full capacity. 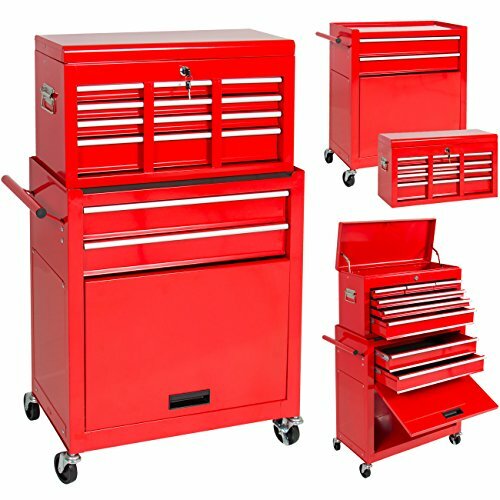 If you are in the market for a portable toolbox, some of the common features that users prioritize when purchasing were compartmentalized drawers, central locking mechanisms, extendable handles so that you can pull it along behind you from job to job, lids on the removable bins, a powder-coat finish, thick rubber wheels, heavy load capacities, foam interior linings for delicate tools, locking front latches to secure your mobile workstation from theft as well as in larger models spacious chest and cabinet areas. There are a variety of different styles available, with the Keter portable rolling organizer resembling an ice chest on wheels all the way to the Best Choice Products portable rolling tool storage chest. The Best Choice Products option is a much larger and more expensive product- and it's better for maneuvering your toolbox around your garage than hauling it from job site to job site. Some of these portable tool box organizers unfold from the center while others are standup options that you face and open that way. Perhaps a smaller option might be better for you- as one of the primary benefits of a rolling portable tool organizer is its ability to provide quick and easy access to tools you need for your home improvement project or technical service needs. If you are a plumber, and require access to a variety of small tools, purchasing an option with many different compartmentalized bins could be a huge convenience for you as you wrestle with a recalcitrant toilet. Electricians that work in rugged areas might need something a bit sturdier- a portable toolbox that can really withstand being banged around but still offer an organized solution for their work needs. One thing all of these different chuck boxes have in common is a pretty high weight threshold- it's imperative that you are able to load it up with all the small and large-sized tools and appliances you need to get the job done without overloading or making the unit immobile. If you are in the market for one of these portable toolboxes-make sure you do your research prior to purchase and understand your individual requirements. 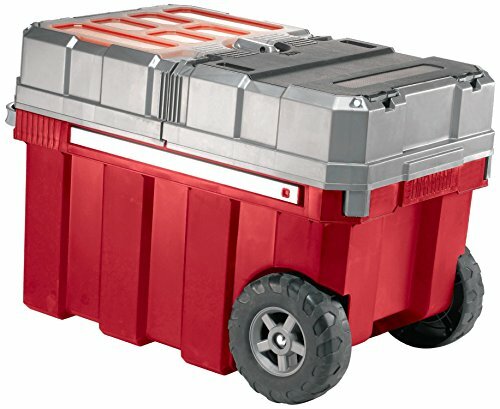 You might want a rolling toolbox that you can cart around with you wherever you go. Or, perhaps, the more stationary model that you can haul and insert into garage areas for short-term work assignments. 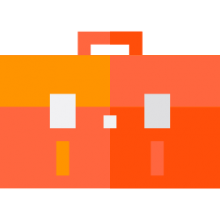 Whatever the case, make sure you check out our comparison table and click through to the different product pages to get a sense of what other users have said about these portable rolling toolboxes.